Formed in 2013, ZENIT is a progressive metal band. Black Paper" was recorded at Rome's kick recordings studios by producer Marco Mastrobuono. The first track "Zenit" is spacey, dreamy, and with synths. We have clean vocals along side vocal harmonies. This is great melodic metal with great rhythms. This song installs a positive mood and is energetic. In the second half of the song, the intensity is a little cranked up and we have harsh vocals and growls that are not well mastered…sounds like they tried it more than they use this technique. "Wraith" is the second track and we are more oriented with Djent, harmonic pitches. Things slow down though when it's time for the choruses. Th vocals are recorded in the forefront, and we have excellent guitar parts and it delivers a great vibe overall, but I don't appreciate the use of harmonic pinches. It also reminds me of TOOL in a way I just can't explain. "Above and Below" is filled with catchy choruses. Pretty fast playing too. We are exposed to clean melodic adventurous playing. Nice rhythmics to add some groove. I like the clean vocals. This is more moving than mean. We have interesting solos here and there and the drum is tight and efficient. "Crow's Perch" has vocal in between metal and core. There are great vocals harmonies. The fast and heartfelt guitar picking add some cool vibes to the song, and the solos are excellent. "King of Lies" required excellent skills of songwriting. The transition goes fluidly. Once again the vocals are recorded on the foreground. They have their identity. I'm kind of getting used to their patterns and structures in a good way. "The Prophecy" drives in a smooth way. But don't get fooled: after a little time the explosion hits you and you get caught for a few minutes till the end of the song. 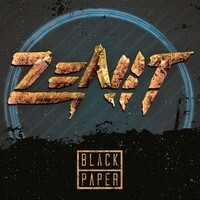 "Black Paper" is the title track of this album. We aim all straight head: Djent crazy guitars leads you to powerful vocal harmonies, and wide expressions of clean vocal chorus…playing with clean and harsh, alternating. Some soft break in soft moments are offered with beautifully played solo parts. Nice songwriting.Overall this band has potential and delivers. Their force resides in the vocals while all instruments are fairly well played. Nice songwriting skills makes this album a nice ride.